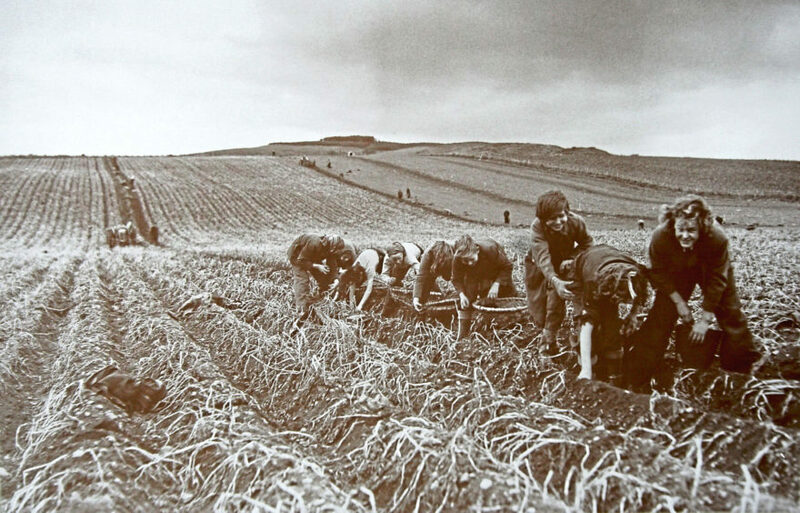 A large squad lifting potatoes in Fife probably in the early 1980s. By this time two row elevator diggers were used with two people picking side by side in each bit. 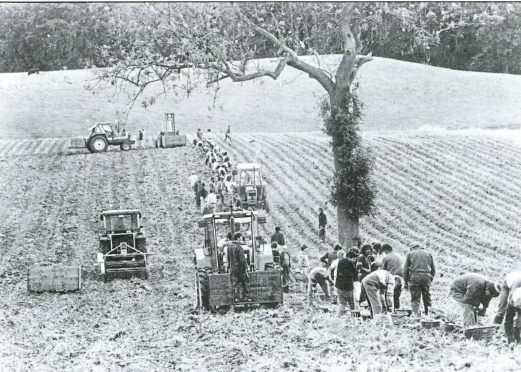 Traditionally October is the month for the potato harvest and before modern machines entered the fields the work was all done by hand. For many of today’s kids the October holidays are ending, with an enjoyable break had by most, including the parents able to take time off to visit attractions or holiday abroad, such is the modern way of life. However, this is a new phenomenon of more prosperous times, one which farming families don’t get to enjoy due to busy work schedules. It’s not so long ago that the October break meant hard work for both country and town dweller alike. Even in the days of the machine piece time was still a welcome break from the monotony as this image shows. Going to lift tatties was an important time for those not directly involved in agriculture. 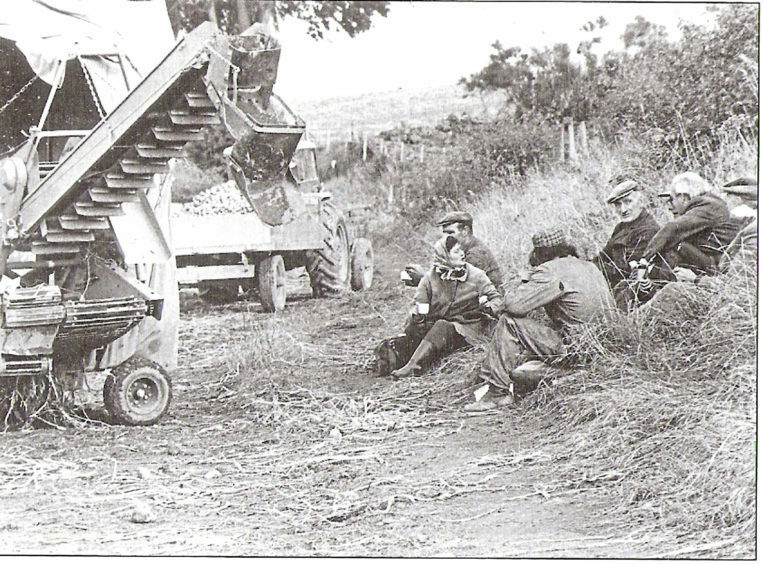 Before the days of stone separation, automatic planters and potato harvesters, all the work was done by hand. From hand planting in spring to hoeing and rogueing in summer, squads of folk were needed to plant and grow the crop. By October the foliage was dying back and hopefully the tubers had multiplied into a bumper crop. This bountiful harvest needed many hands to gather it after the spinner digger had scattered them from the drill. Many housewives took the chance to earn extra income by gathering tatties for local farmers, often using it to clothe their bairns for the winter. These hardy women with their deft hands picked much faster than men, who were not idle either having to empty the baskets, cart the loads and pit the spuds in the triangular clamps at the field edge. It was a busy back-breaking time for pickers and men alike. Morning piece time was a welcome break for the body, which had still not loosened up for the day’s toil. Dinner time was a longer halt when there was time for a bit of banter at the back of the dyke. For the pickers there was an afternoon piece break too, but the farm staff had to clean and grease the digger. With the piece bags now empty of the day’s sustenance, the pickers would fill them with the day’s boiling which more often than not, far exceeded the daily need. If it was a big field and the part being dug was a bit away from the fence, the piece bags were often set down between the drills and shifted further across as the digging went on throughout the day. Woe betide those who forgot to move them in time and the tractor wheel ran over them, leaving broken flasks and squashed sandwiches. The unfortunate person would cast an evil eye at the tractorman responsible. The tractor driver in turn would cast an evil eye on any person leaving a wire basket in the way of the wheels, leading to a flattened piece of mesh unable to carry anything. A group of children gathering the crop into wicker baskets on what looks like a very long round for the digger driver. Tractor usage in the tattie field increased during the Second World War with mechanisation helping increase food production in times of labour shortages. It was at this time when the schools closed to allow schoolchildren to supplement the labour supply to get the vitally important potato crop secured. For many a schoolkid not acquainted with farming it would be a rude awakening only helped if mum was part of the squad too. Tractors and bogies or farm lorries picked them up on a cold morning and took them to the field where a stern-faced farmer or gaffer would greet them and show them to their bits, which were marked out by thin branches from the hedge and marked the distance to be picked on each run of the digger. The first run would be followed by the first of many gradually pain-inducing bendings of the back to gather the freshly exposed tubers. Experienced women pickers and farm staff would keep the kids in check to get their bits picked before the digger began again. The ability of the kids would decide how long their bit would be and if they needed to share it with another bairn struggling to keep up. Squabbles would start when some were not deemed to be pulling their weight and clods and spuds would be thrown before it was broken up. Clothes were shed as the sweat built up, with meal times and breakdowns the only high spots for the hard-pressed bairns. Only the brown pay packet at the end of the week kept them going – even then only for mum to take it to supplement the family budget. Kids today have never had it so good.